McIlvanney creates a layered, thoughtful story, rich in observational and philosophical asides told through evocative prose that has a nice cadence and vividly conveys the local dialect. I broke my own rule after reading this - went straight on and read the third. Didn't regret it. 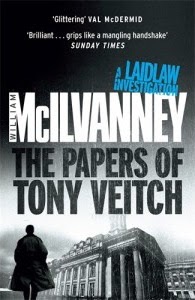 I'd be hard-pressed to think of a richer group of crime novels than McIlvanney's Laidlaw books. To whet your appetite for Strange Loyalties here's a bit of what I've written about the book. As I will be starting this series sometime soon, I am glad to hear how much you enjoyed it. Great review. Jose, yes, I think you're right! Sandra, I've put in an order for Strange Loyalties. Peter, thanks for the link. Yes, I think you're right that he blends compassion and humour, but for my money I think it's the cadence and observational and philosophical asides that sets him apart. He reminds me of James Sallis a bit. Tracy, I think you'll like them. "Glasgow has an opinion about everything. I don't think it's hard so much as confrontational." 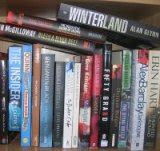 The same James Sallis who attended Crimefest the year before McIlvanney did. You ought to show up yourself one year. Peter, yes, I should get there one year. My problem is that I do so much travelling with work - away at least once a month - scheduling these events in without becoming homeless!